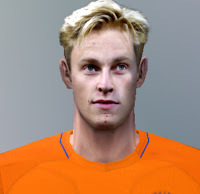 PES6AREMA.COM - To update your Pro Evolution Soccer 6 patch you should to download this Frankie de Jong PES 6 Face and hair. This update is created by GREEK Revolution Patch. So give them much credit and thanksfull.